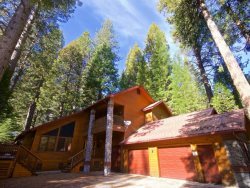 The 2700-square foot air-conditioned custom home is located in the Marina View area of Bass Lake. This big beautiful home opens to a beautiful great room with soaring windows to let in natural light, as well as a new large screen TV and sound system. The gorgeous kitchen features new stainless steel appliances, tiled floors and granite countertops. The dining room has a massive wood table that seats 8 people. The upstairs den features a foos ball table as well as a TV. The master suite is on the entry level, and has its own sliding glass door opening to a deck, as well as a king bed and a private bathroom with a large jet tub. There are four bedrooms upstairs, two which also have doors to an additional deck. Amenities include high-speed Internet and WiFi, central air conditioning, cable TV, Dishwasher, Microwave, Washer/Dryer, outdoor gas grill, and parking for 4 cars. Satellite TV, High Speed Internet and WiFi, Stove, Oven, Dishwasher, Microwave, Disposal, Coffee Maker, Toaster, Blender, Dining Capacity 8, Central A/C, Propane, Washer, Dryer, Gas grill, Boat Slip in private marina.